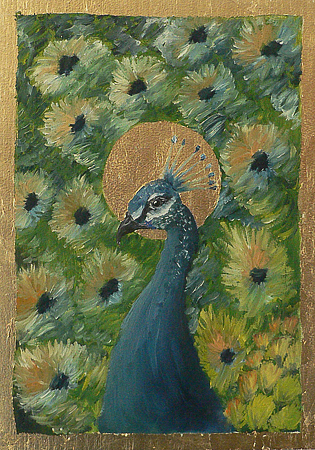 I have been increasingly interested in painting birds, because of their wide range of mythical and poetic symbolism. At the same time I find myself impressed with early Renaissance icons and altarpieces for their simplicity and directness, both in composition and meaning. This series of icon paintinings is a combination of these two ideas: humans replaced with birds in the traditional format of icons. By doing so, it is my belief that this work questions what is sacred. Though compositionally simple, the “bird icons” point towards a complex reflection on the relationship between nature, art, and the sacred. Through this series I am also reminded that art can be both a fun and provocative way to explore big questions.